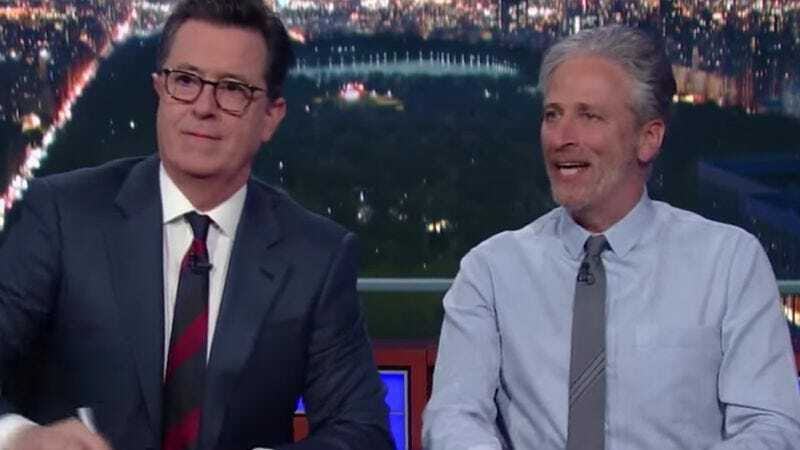 Proving once again that retirement just doesn’t suit him, Jon Stewart burrowed his way to the Late Show last night to give the media a much-needed pep talk. The press has not only suffered the indignity of being declared an opponent of the public, having various papers of record shut out of White House briefings, but is also looking down the barrel at the dullest White House Correspondents Dinner ever (though at least they won’t have to worry about President Twitter making an appearance). So what, says Stewart. If that cyclone of hair and hate speech won’t allow them to sit in a room while his sycophants struggle to form coherent sentences, then they’re better off without those Mad Libs-styled press conferences. Even though he spent years highlighting their shortcomings—CNN in particular, he notes—while he was the Daily Show anchor, Stewart tempers his tough love message with some kind words for the media. He urges them to do something for themselves (and the public), like actual journalism. Because even though he’s capricious as all get out, Trump’s a septuagenarian, and “70-year-old men don’t get less cranky or less racist as time goes on.” So they shouldn’t wait for a change of heart.